What would be more fun than pulling together a Scottish-themed party? No kilts required here -- just a hearty appetite for mouth-watering cuisine. Contributed by Ms. Ricky Eisen, Founder and President of Events and Celebrations by Between the Bread. When thinking of Scotland, many people might initially associate it with the plaid patterns that the country is so recognized for. The plaid fabrics are actually called tartans and are historically used to represent clans or families. Choose a tartan pattern you like and use it as a table runner. You can then pull colors from this pattern and use it in your decor, candles and centerpiece. Much of Scotland is beautiful countryside, so utilize earthy, lush greens in your decor and centerpiece to create a rustic feel. Heather is a Scottish shrub and complements some of the tartan patterns. Add river stones and moss to the table decor to enhance the feel of the outdoors. Cuisine -- Scottish smoked salmon is world-renowned and a versatile appetizer. Use it when making mini quiches, canapés and tartlets. For the main course, choose a local fresh fish such as haddock or halibut. Use it grilled or if you are more ambitious, make a soufflé. Dessert is the most fun to have. Can you have a Scottish party without shortbread? Dip a corner in chocolate and cover it with chopped nuts or sprinkles for a fun twist. And, of course, make delicious Empire biscuits to add a traditional touch. A neat trick is to add Scotch to any baked dessert for extra flavor. Keep in mind that when adding liquor you'll need to add it before the cooking or baking process is completed so that the alcohol evaporates. Another unique dessert idea is to add Scotch to store-made caramel syrup or butterscotch. Blend it well in a sauce pan over medium flame and pour it warm over some vanilla ice cream. Cook the shallots in the olive oil until they are translucent. In a bowl, combine the eggs, milk and cream. Add the smoked salmon and the goat cheese and stir them together. Pour them into the pie crust and bake for 30-40 minutes. Haddock is a firm, white fish widely eaten in Scotland and Great Britain. Throughout the movie, we see Princess Merida and her royal family feasting on this traditional meal. Between the Bread put a twist on the traditional haddock and made it into a personal-size soufflé. In a bowl, mash the potatoes and add the fish, egg yolks, butter and cream. Mix in the Dijon mustard and the Parmesan. Mix them well and season with the salt and the pepper. Combine the egg whites with the fish mixture and pour them into the ramekins. 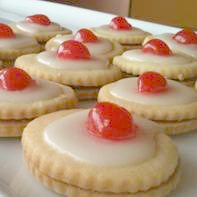 Empire biscuits are a traditional Scottish pastry made with shortbread cookies. They are just like the pastries that Merida and her brothers are seen snacking on throughout the film. Stir in the flour to make dough. Roll the dough out with a rolling pin to 1/4-inch thickness. Use a 3- to 4-inch round cookie cutter to cut out circles. Place the rounds on a baking sheet and bake for 8-10 minutes. Allow the cookies to fully cool before topping them with 2 teaspoons of the raspberry preserves. Top with the cooled cookie. Stir together the milk and the confectioners' sugar to make a thick glaze. Spread on top of the sandwiched cookies and top with the cherry.